Like most authors, I have played around with marketing to see what will work and what does not. I have tried FaceBook to the tune of up to $1,000 just so YOU authors who are trying to watch your pennies do not have to experiment and waste your money. I have tried FaceBook to advertise my book signings and I have paid close attention to what results I am getting. I must say, I am extremely disappointed. I have used the boost feature and I have also created ads. None seem to really draw in the readers like using Amazon Kindle Select. I am not trying to advertise for Amazon because, frankly, the way Amazon monopolizes the book selling industry is good for authors, and then its bad. To use Amazon Kindle Select, you must be EXCLUSIVELY on Amazon, which means no Barnes and Noble, no Apple or any other avenue for your digital books. WAIT!!! Before you decide Kindle Select is the bad guy, let me give you just a little more information, and then I will chat about FaceBook once more as this post is about that. I can say that even when I am on Barnes and Noble, Apple and Amazon, I sell one hundred books on Amazon compared to the one I might sell on Barnes and Noble and Apple. So, is it bad or is it just the way things are? You decide. FaceBook. I continue to have hope that in someway, FaceBook will be of use. As of now, if you have only one book published, I would absolutely say NO it is not worth it. I would also say trying all the FaceBook groups to get your book out there is another area that is a failed experiment. See, the thing is, there are so many authors posting on those pages that any ad you may put on there gets pushed down quickly and within an hour, it's so far down it might as well have not even been there at all. You might think that it is great to join a group with 18,000 followers, but that translates to authors who are posting and very few readers who are clicking on your book to buy it. The positive about FaceBook: If you are in need of reviews, there are a lot, and I mean a LOT of authors who are looking to exchange reviews. You need to be picky as you will definitely have authors eager to swap reviews. Surprisingly, I have found almost all of these authors to be genuine and good people. Yes, they are hoping for a five star and they are eager to give you a five star, but the interesting thing is, if your material is not worth raving about, most of these authors will just decline to leave a review and be fine with moving on. They typically will not leave a negative review, which is critical to the life of a book. In conclusion, FaceBook does have its strengths, but as far as advertising and bringing in the dollars, I would give it a solid thumbs down. Now, the most important question you should ask is, Author Allen J Johnston, would you still try to advertise on FaceBook? Well....I will oddly say...yes, because I hope that I may find that something actually works. It should. There are so many people on FaceBook that something should, so I will continue to experiment until I find what lights that fire and gets results. If you have found that something you are doing is working, PLEASE POST so other authors can have a chance. We authors must support each other because no one else will. It's why I write these blogs...for you!!! I am very excited to announce my third book signing for The Divine Series at the Barnes and Noble in the Lansing Mall beginning at noon. There will be limited copies of each book available at the signing. I recommend checking out Amazon to order a copy to bring along. I could not be happier with how many of my readers are showing up at my events. It's fantastic. You all are amazing people and it makes me happy to see those that appreciate my work and have come to love my characters. I wouldn't be where I am without you, so Thank You! I also have other very exciting news that I am super pleased to tell my readers about. For this book signing, I am bringing the characters to life by having those very people on the cover of my book there to sign the books that they are on. 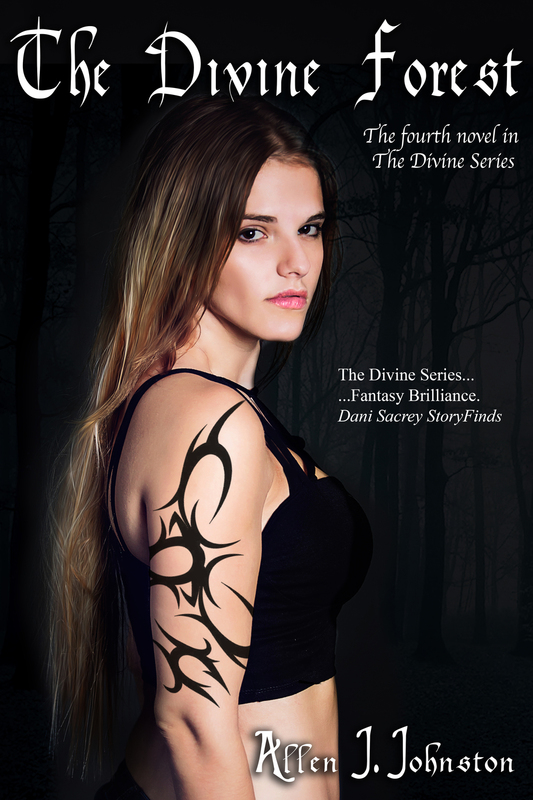 If you are as smitten with Darcienna as Kade is, you will have your chance to meet her and have her sign your book. If you want to meet Kade's most fierce protector, Ven, you will have your chance. It is rare that an author goes this extra mile, but I want my readers to be as excited about this book signing as I am to be doing it. Don't forget that I have sample chapters of each book available on Amazon. I hope to meet you at the signing! In a previous blog, I posted tips on how to deal with negative reviews but it seems to come up so I am posting a blog specifically about reviews. I hate this book and wish I had never spent the $.99 I did. I can't believe how bad this book was. I would not even use this book to line my cat box. This book would be best used for kindling. Poorly written. Bad character development and no plot. Now, tell me that you don't fear seeing a post that really tears into your book. If you are an author, your reviews are critical to you. We all want to see glowing reviews, but no matter who you are, it won't always be five stars. You must be content with the overall review average. The more reviews you get, by the laws of statistics, the more chance that someone will leave you a negative review. There are a few things I suggest. Check with the reviewers history and see if they are fair or if they are just a Simon Cowell wannabe. Yes, he helped pave the way for many reviews to think it is something special to tear apart someones work. Some reviewers can be harsh and even down right mean. Try to see if what they are saying has any validity. I had someone, who wrote like they did not pass third grade, give me a bad review while everyone that appeared to have a high school degree wrote amazing things about my book. That helped me just shake my head and move on. I hate to say this but when asked by other indi authors to review their work, I cringe. It would blow your mind to see how many authors don't understand that a plot needs to emerge prior to almost half way through the book. Just the other day I had to explain to an author that I need a reason to want to read his book. His character was predictable and very cliche. It was boring and a third the way through the book I would not have cared if the main character died. My point: Some books deserve the reviews they get. I really hope yours is not one of them. Now, what can you do if you get a bad review? You can respond. Almost all sites allow for comment on a review. The reviewer will get a notice that their review has received a comment. Okay, DO NOT respond in anger. It would surprise you how many people respond harshly. This will only show people that you are bitter. When you respond, be polite and be appreciative, even if you want to lay the most vile curse on them and their entire family line. Here is what I said to someone who was not pleased that my writing style was not like Stephen King. Thank you very much for buying my book and taking the time to read it in such detail that you were able to give such a complete and in depth review of my work. As for other reviewers and their opinions, their input needs to be respected as does yours. Not everyone is going to like all books. For example, you cite Stephen King as a great read while I wish I could get back the time I spent reading The Eyes of the Dragon. You also rate Ender's Game as a 2 star while it has exploded so much so that it was even made into a movie. This shows it comes down to personal taste, which is the way it should be. With that said, your input gives me some things to consider. I do appreciate it and welcome all constructive input. Since you took the time to post this review, I would gladly be willing to send you a signed copy of book one, two and three to see if it addresses any of the issues further in the story line that you find fault with in book one. Feel free to go to my website www.allenjjohnston.com and send me an email. I would enjoy receiving your feedback on the entire story line. In conclusion, I would say that all readers should take a look at my sample chapters and decide for themselves if they like my writing style. Thank you all who take the time to leave honest and constructive reviews. This got me very positive feedback and some reviewers even stepped up to admonish him for his criticism. I even got emails from people who saw his review telling me how much they love my work and to not let this review bother me. No matter what you do, do not advocate another reviewer tearing into another reviewer. Thank them each for their input. Also, see how I ended my comment? I encouraged all readers to judge for themselves. Feel free to copy my comment and use it yourself. I used this negative review as an opportunity to get people to consider my book themselves. I turned this negative situation into as much a positive situation as possible. If you use my response, tailor it to your own needs, but do your best to keep any negativity out of it. If you want to be taken serious as a writer, you do not want a reputation for being argumentative or jaded. If readers see that you took the high road, they will respect that. There will be NOTHING gained from being offended and responding in anger. Now, if you read my first paragraph, you will see that I found a way to weaken his review against my book. It is a valid point, but it does allow me the ability to speak up for myself. Be gentle and make certain it is constructive and respectful. I hope this has helped calm your nerves and relieved some of that sick feeling many will feel due to a bad review. Please comment below with your input so we all can improve our careers as writers. Thanks for reading and may your writing career flourish. Okay, this is for my cherished followers who enjoy my posts and series. I have a dilemma and I want your input. Normally, I have close to two hundred covers to choose from and one just jumps out at me. This time...I am struggling between two that appeal to me very much. So, I want to ask your input. Normally I post things in my blog so as to help others. This time, you get to help me. Look at the covers and leave your feedback on which one appeals more. Feel free to discus it. Why does it appeal? Thanks and I can't wait to hear what you all have to say. Cheers. First, let me answer the question of what is considered a successful book signing. As soon as you sign one book and put it in someones hands, you have had a successful book signing. Yes, we all want them lined up down the block and around the corner, but unfortunately that is rarely the case for 99% of book signings. You can expect to show up and set up your books with no one even realizing who you are or what you are doing....unless you take a few steps to help make your signing something special. I can say I have been lucky enough to have people waiting for me, but for the most part, I don't start seeing interest until I am there and ready to go. So, what will help? Well, let me give you some tips that I use. I have a 30X40 poster made up with pictures of my book and some tidbits to entice readers to want to read my story. If you work with your book store and find that they are willing to post a notice of your book signing a few weeks out, they will probably let you put additional advertising up to help boost the signing. The next tip is posting on social media. This can be expensive, but it can be done successfully. I use Facebook the day before my signing and the day of the signing. I make certain to target the city I am in or you will just be wasting your money. When you write your post, write it as if you are someone reporting about this amazing author coming to town. If you post it as yourself, people will tune it out. It's human nature for us to ignore self-promoters. We tend to get more excited when it looks like it is being reported. Okay, so lets jump to the signing. You are all set up and ready for people to line up, but there is no one. This is almost every authors experience unless you have lots of money to throw at advertising. It's okay. So what should the 99% of us do? For me, I have tried many techniques to see what works best. If you expect to set up your table and sit back all relaxed, waiting, you may be waiting for a long time. It may work, but what I have really found to be successful is getting out from behind the table and talking to people. It will blow your mind when you introduce yourself as an author and see people look at you as if seeing you for the first time. Most people will become interested and will be eager to talk with you and even pick up your book. DON'T BE PUSHY!!! You are introducing yourself as an author, and you are just saying hi. Most of us feel uncomfortable approaching a stranger and trying to find what to say. Here is how it goes for me. Awesome Author: How are you doing today? Soon-to-be reader: Blank look or maybe "Good." Either is okay. You just want their attention. If they won't look at you, leave them alone. Awesome Author: I am doing a book signing today and just wanted to say hello. Soon-to-be reader: "Oh. Hello." Most likely, they will be polite and pay attention while you are talking to them. I have found that 90% will happily engage me in conversation. Awesome Author: So what genre do you like to read? Soon-to-be reader: "I prefer FANTASY." Awesome Author: "Oh, I love that too. In fact, it is what I write. Feel free to take a look at my book. I am over there signing books." I would say 25% will follow me back and half of those will gladly take a signed copy home. You DO NOT want to be pushy. People see authors as mini celebrities. You don't want to be reduced to a pushy salesman. Say hello to people as they come in the store. Smile, be polite and relax. Pretend you are talking to a friend. I know people get nervous, but once you get in a groove, it's fun. Try it. One last tip: Be strategic about when you do a book signing. If there is one day of the year where you want to do a book signing, it is the Saturday before Christmas. The stores are LOADED with last minute shoppers looking for the perfect gift. What is more unique and special than a personalized book straight from the author? Otherwise, ask the manager or PR person their opinion. Please leave a comment and give your opinion so we can all help each other be successful. Thanks for reading and I would love to hear how your book signing goes. Cheers.